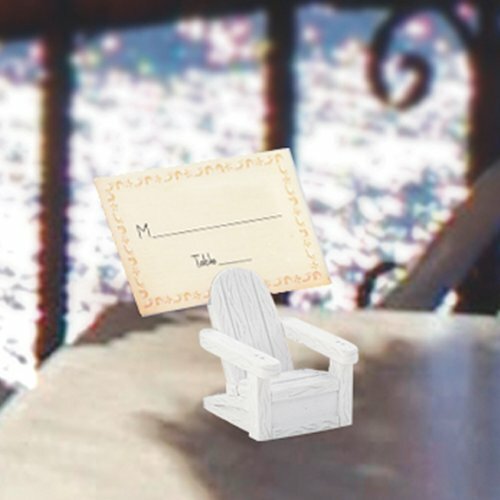 Finding the right beach wedding favors is a breeze with these adorable Adirondack chair place card holders. Searching for beach wedding favors that really capture the leisurely seaside atmosphere? Well, what could say casual and comfortable better than these white resin Adirondack chair place card holders that cheerfully invite your guests to take a seat and relax? These tiny chairs make lovely and unusual beach wedding favors that your guests can use at home to hold a photo, note, etc. These chair place card holders come in an individual poly-bag. They measure approximately 1.75", they are also fitting for any beach themed occasion. These chair place card holders come in an individual poly-bag. They measure approximately 1.75", they are also fitting for any beach themed occasion.